TEMPUS 2. 4 Face clockwork edition. TEMPUS 2. 4 Face. 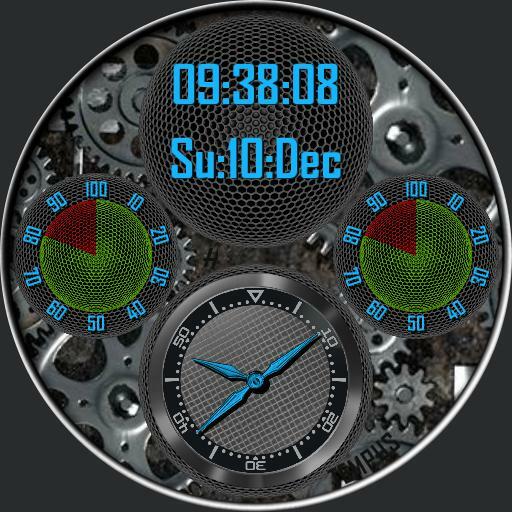 Face 1, Clock work animation, Analogue clock face, smooth seconds, digital time, date, short day, day number, short month. Power level for watch and cell. Face 2, weather icon and current temperature, Sunrise and Sunset icon and times. Face 3, Step icon and number, Heart icon and rate, Stopwatch. Face 4, hides All info with covers. Tap actions, mid left next ucolor for clock background colour and fonts, mid right previous ucolor, Tap centre to swap between faces.